Said to be an old Greek name for a similar plant (Compositae). 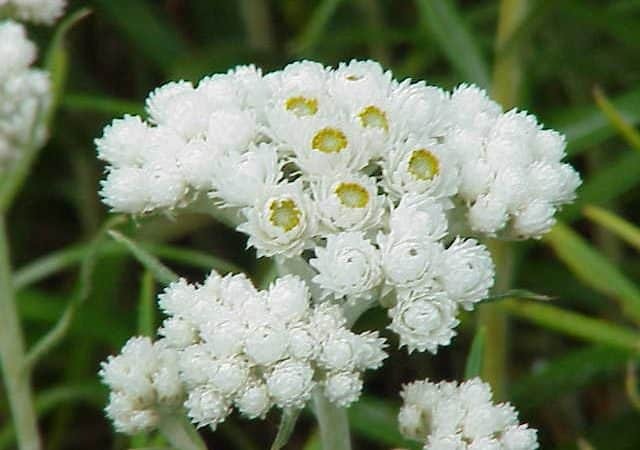 Hardy perennials with white wooly foliage and flowers which can be cut before maturity and dried for use as `everlastings’, sometimes being dyed.Species cultivated A. margaritacea (pearly everlasting), 1 foot, white throughout, flowering June-August. A. nubigena, 6-9 inches, silvery white foliage, flowers white, summer. A. triplinervis, 12-18 inches, soft wooly silver foliage, pearly-white flowers, June-August. A. yedoensis, 2 feet, leaves gray above, white below, flowers white, summer. Cultivation Anaphalis are suitable for the rock garden or for borders, according to size. An ordinary garden soil and a sunny position suits them. They do well on chalky soils. Plant out in autumn or spring. Established plants may be increased by division at the same seasons. New plants may also be raised from seed sown outside in April.